Women (particularly Democrats) are running for political office in record numbers. After the recent primary elections (including one in Connecticut), voters will choose from an unprecedented number of female candidates—198 in the U.S. House, 19 in the U.S. Senate, and 13 gubernatorial candidates. So, if a change is gonna come, it will need to include some much-needed renovations in the halls of power. Last-minute meetings make it difficult for people responsible for child care to attend. Caucuses at 2 a.m. have the same effect. If women will be political leaders, there will need to be a shift in how we do things, and what we expect of our politicians. “I think the more women we see in leadership, the more we will see family-friendly shifts,” said Patricia Russo, executive director of Women’s Campaign School at Yale University. An example of one shift? In May, the Federal Election Commission ruled that candidates who run for federal office can use campaign funds to pay for child care, provided those child care costs are incurred while campaigning. That’s for federal candidates. In Connecticut, the State Elections Enforcement Commission told Caitlin Clarkson Pereira, 32, a Democrat who is running to represent Fairfield’s 132nd District, that such use of state campaign funds is not allowed. Mae Flexer, a state senator from the 29th District, is executive director of the Connecticut affiliate of Emerge America, which recruits and trains Democratic women to run for office. Flexer said her organization trained 33 women this year to see the political world as it is, and to plan to help change it. 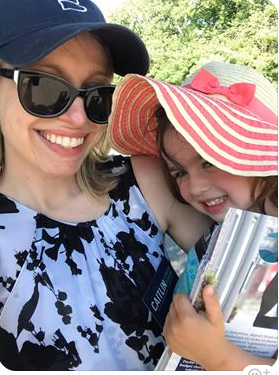 Caitlin Clarkson Pereira, 32, a Democrat who is running to represent Fairfield’s 132nd District. For office-holders, more attention paid to scheduling and the timing of meetings would be helpful for candidates—particularly women—who are responsible for child care. Christine Palm, former spokeswoman for the Permanent Commission on the Status of Women, and the Commission on Women, Children, and Seniors, is running on the Democratic ticket for the 36th House District. In the recent primary, Jillian Gilchrest, who bested a 12-term incumbent for the Connecticut 18th House District, said political parties need to be willing to open the door for new leaders. Improbably she won, defeating a far more seasoned and connected politician. Here’s something else improbable: Her opponent was a woman—Mary Glassman, the party’s endorsed candidate and former first selectwoman of Simsbury. In New York, Alexandria Ocasio-Cortez defeated 10-term incumbent, Joe Crowley, to get on the ticket in November. In Vermont, Democrats voted to place Christine Hallquist, a transgender woman, on the ballot for governor. The New York Times called the primary election “groundbreaking.” That’s exciting. Now we must go about moving some walls and making way for more women.